Great news! After just a day and a half we have met our goal and Marc can officially get what he needs and start drawing again! To say we’re both blown away would be an understatement. I knew the fans would come through for us, but to have it happen so fast is astounding. My plan had been to shut down the GoFundMe as soon as we reached the goal, but I have actually received a request privately asking me NOT to do that so that they may have a chance to contribute at the end of the month when they have the means to do so. I’ve also heard from a couple of people who have expressed that they would really like to see Marc get the better tablet so he can be restored to full, speedy functionality. I would love to see that happen as well, so since we’re going to leave this open for another week anyway I say we see what happens. Please feel free to keep spreading the word! Your generosity and love and appreciation for both Marc and SF is incredible. Thank you, everyone. Thank you! Hey SuperFogeys fans! Been a long time, but we’ve got a pretty good explanation as to why you haven’t heard much from us since the successful conclusion of our Kickstarter campaign. You can cut to the chase right here, or keep reading below. The SuperFogeys is stuck. In August 2018, just after the completion of Chapter 22, Artist Marc Lapierre’s Cintiq tablet–his primary tool for art creation–gave out on him. Kaput. Finito. And he hasn’t drawn The SuperFogeys since. Marc moved to the Cintiq tablet years ago. It sped up his process considerably and noticeably upped the quality of the art, particularly the inking. The simplest solution to get the SuperFogeys back on track is for Marc to go back to the old way of doing things, draw on paper, and take twice as long. 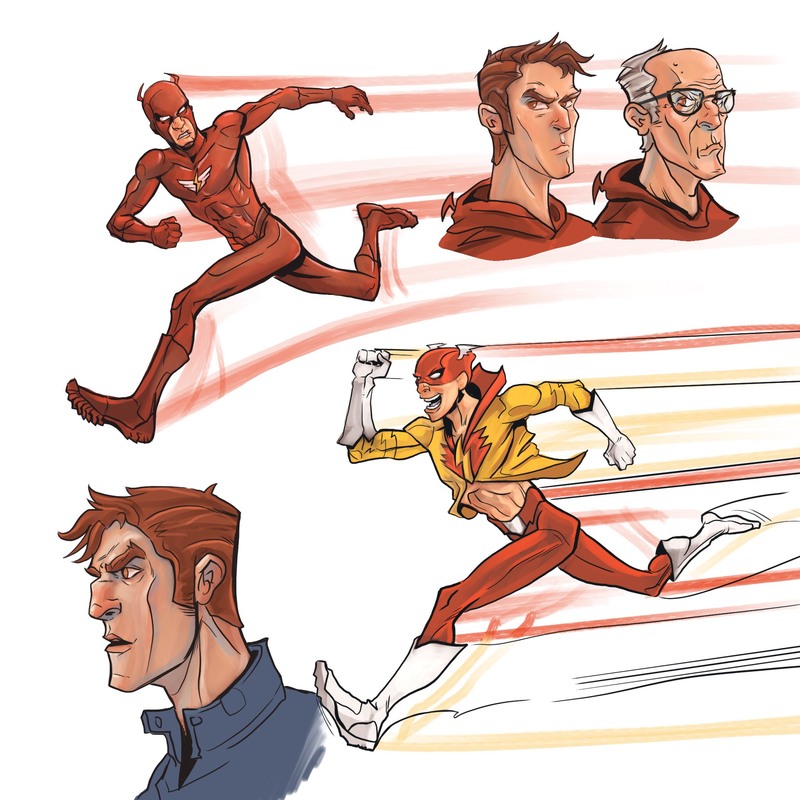 With a Cintiq, Marc was running. This would be asking him to crawl again and I just can’t feel good about that. I can’t ask Marc to do that, and I can’t ask his family to sacrifice their father and husband like that when they’ve sacrificed so much to this labor of love already. SuperFogeys, as most of you know, is not a huge moneymaker. I am HUGELY grateful for our Patrons because they do ameliorate some of the costs and keep us going with their enthusiasm and support, but in truth SF exists because Marc takes the time to draw it. It’s simple as that. When I couldn’t draw it anymore–when I was going to straight up shut SF down halfway through Chapter 10(! )–Marc stepped in, took the artistic reins, and kept things going. And here we are, years later, with Chapter 23 waiting in the wings–with the story just a few chapters away from wrapping up completely! I don’t know about you, but I want to see it finished. 1. Repair his existing Cintiq. This would cost $700, but because of the issues he’s had with his particular model, Marc fears it would break again. That’s a non-starter. 2. Purchase another Cintiq that is comparable to the model Marc’s been using. This would cost upwards of $1500 and, for Marc, that’s another non-starter. It’s too much to ask. 3. Purchase a cheaper model that would still allow Marc to get the job done for $650. The biggest difference between this cheaper Cintiq and the one Marc has been using for years is that this cheaper one would be tethered to his PC, whereas the more expensive model allowed Marc a great deal of portability and, thus, flexibility in when and where he could draw. To get back up and running again, Marc is more than okay with sacrificing that portability and flexibility. So, that’s where we’re at: $650 to get SuperFogeys back on track. And you can make it happen at the GoFundMe right here. If just a fraction of the SF fanbase can give as little as $5, we’d easily hit this goal and Marc could be drawing again the very next day. Because: Chapter 23 is already written. It’s a short chapter, just 12 scripts, but they’re already done and waiting for Marc. 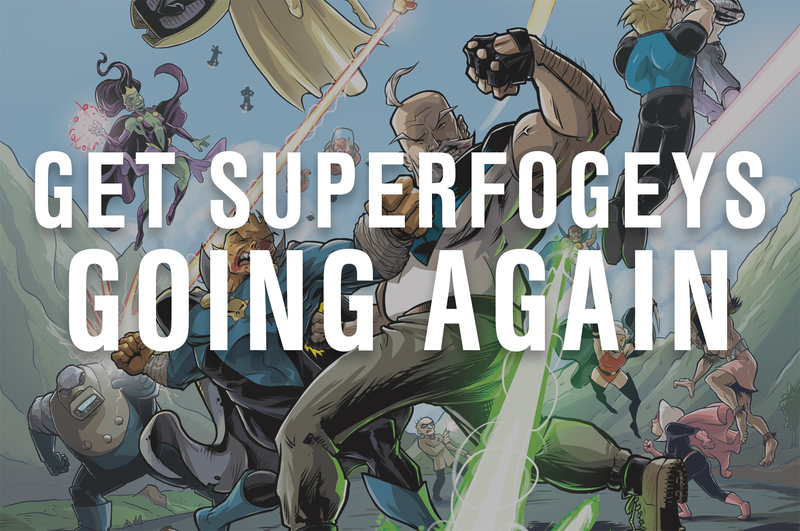 New SuperFogeys could be here very, very soon. And, since those scripts are written, my promise to you is that I will immediately begin work on Chapter 24, allowing Marc to continue right on into it and skip the customary hiatus between chapters. 1. Didn’t you guys just run a Kickstarter? And now you’re asking for MORE money? The Kickstarter was, of course, not a fundraiser. It was for the printing of SuperFogeys Volume One and everyone who contributed will be getting the product they paid for (very soon in fact). The Kickstarter covered the costs of the printing of that book and NONE of those monies served to line anyone’s pockets. 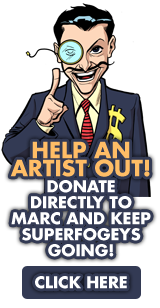 This fund is JUST so that Marc can get back to drawing and creating new episodes of SF. 2. Wait…weren’t YOU supposed to draw Chapter 23? I had previously announced that I would be the one drawing Chapter 23, but after full-on drawing the first four episodes, I was forced to conclude I just wasn’t the right man for the job. This era of the SuperFogeys is marked by Marc’s designs and sensibilities and he needs to be the one drawing this story right now. Perhaps I will return to art duties at some future date for a brief epilogue, but right now it’s just got to be Marc. FINAL THOUGHTS: I hope you’ll join me in helping to get SF back up and running. We can’t wait to bring you the next part of this story, and I personally can’t wait to see how Marc continues to grow and improve as an artist. He is a truly under-appreciated talent. Let’s get him back to doing what he does best. Yesterday was my book birthday. I wrote a book, PAPER BAG MASK, and you can buy it right now. I mean…that’s real. Also yesterday, PAPER BAG MASK shot to #1 on the Amazon New Release Teen & Young Adult Fiction chart. How completely nuts is that??? PAPER BAG MASK is a prose novel/comics hybrid (how does that work? Trust me, it works) I like to describe as The Breakfast Club by way of Ocean’s 11. At the same moment he catches his teacher giving illegal drugs to a student, Redmond Fairweather loses his friggin’ mind and steals Mr. Street’s prized possession—a stupid wooden sword with round edges that will never, ever cut through anything—“The Whomper.” Redmond has no idea why he stole the Whomper. He guesses his extreme dislike (okay, hate… so much hate) of the school’s most popular teacher probably has something to do with it. To his surprise and delight, the hottest girl in school, Elodia Cruz, hates him too. Soon, Redmond’s small band of misfit friends joins up with Elodia and the most popular kids on campus to hold the Whomper for ransom, pull off an elaborate, broad daylight heist to steal something even bigger from Mr. Street, and expose their teacher for the scumbag he really is. I can’t even describe to you what it feels like to hold a book in your hands that YOU WROTE. The feeling of accomplishment is, not gonna lie, pretty great. I worked on this thing for years and nearly gave up this whole writing-to-be-published thing several times. The last time I almost gave up? About three seconds before the #PitMad pitch on Twitter that attracted the right set of eyeballs to set me on the path to today’s publication. I have endured more rejection than I care to admit, and suffered with a smile through more critiques than I would have liked. BUT, I always took those critiques seriously, and I wore that rejection like a badge of honor. Most days. There were some days when the rejection got to be too much and that’s when I almost quit. But, I never did. I don’t know how, but I never did quit. I kept going. I set aside two entire books I’d written that weren’t getting any tractions, and I kept going. And then I wrote this weird, prose/comics hybrid-of-a-book about this lonely kid who steals a prized possession from his teacher and holds it for ransom. And I made it snarky and clever and funny, and honest and devastating. And entertaining and compulsively readable. At least, I hope I did. It’s not up to me anymore what the book is or isn’t. Today, it’s in the world, available just about everywhere, and I don’t get to say it’s any of those things. Now, PAPER BAG MASK has far more than just my eyes on it. The beautiful minds behind those eyes are going to decide what I’ve done or haven’t done. Is it a good book? Is it not a good book? It’s out of my hands at this point. And I’m okay with that. So, world, here you go. I wrote a book and you get to read it. I hope you like it. But, even if you don’t, thank you for reading. Thanks for giving me a chance. PAPER BAG MASK is available on both Kindle and in paperback and you can grab your copy right here. Head on over to my Facebook page to see me read the first chapter live and get a preview of the art inside the book! Jul 10, 2018 BIG NEWS! Brock Just Signed a Publishing Deal for His Debut Novel! Site Broken! New Posts Still Available! Hey everybody, sooooo you’ve probably noticed we’ve been having a lot of trouble with the site lately. This is entirely down to server/host issues. The site is not broken, it’s just not being served well. We’ll soon be changing the host up, but in the meantime you should know that new updates are always, always, always available on our Patreon page. Now, we may not have your patronage, but not to worry–if it would be public and for free here, it’s public and free there as well. Still, I’d be remiss if I didn’t take this opportunity to ask that if you do enjoy SF that you consider making a small contribution via Patreon. It costs a lot of time and money to keep SF going, and the little bit we get at the moment from Patreon doesn’t cover all costs, but it certainly helps. Thank you! BIG NEWS! Brock Just Signed a Publishing Deal for His Debut Novel! Hey everybody, just wanted to share a quick bit of good news with you all… I just signed on the dotted line to have my first novel debut this Fall! It’s called Paper Bag Mask and I like to describe it as Ocean’s 11 with a heavy dose of John Hughes High School Movie (The Breakfast Club, Ferris Bueller’s Day Off, etc.) You know I’ve been focusing more on writing these past several years, and if you enjoy the way I spin a yarn (i.e. 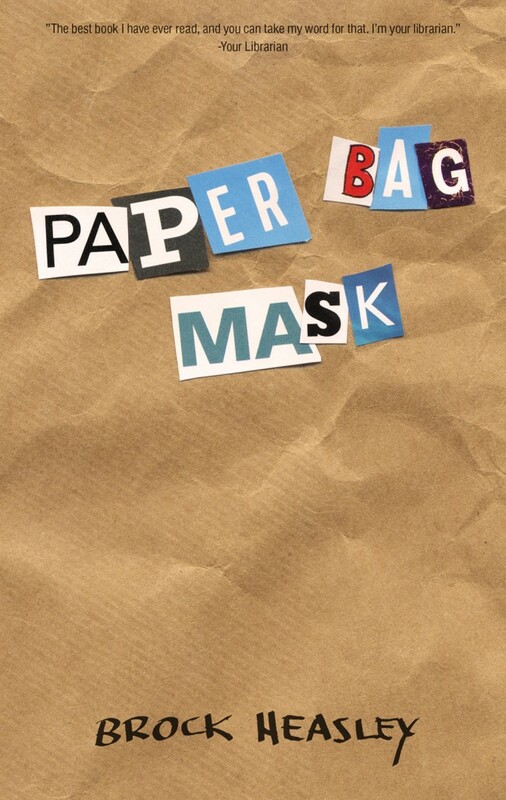 twisty plots, quirky characters, emotional resonance, fair bit of humor) I think you’ll find a lot to love in Paper Bag Mask. 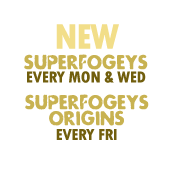 SuperFogeys Return Date Coming Very, Very Soon! Hey SuperFans! I know it’s been a long time, but I wanted to pop in and assure you that work on SF Chapter 22, “The Dastards” is in full swing! The biggest reason for the delay is simply that Marc wants to get a BIG buffer in the hopper so we can minimize if not outright erase any interruptions in posting the new chapter. Announcement for an exact return date is coming very, very soon. We really, really appreciate your patience. 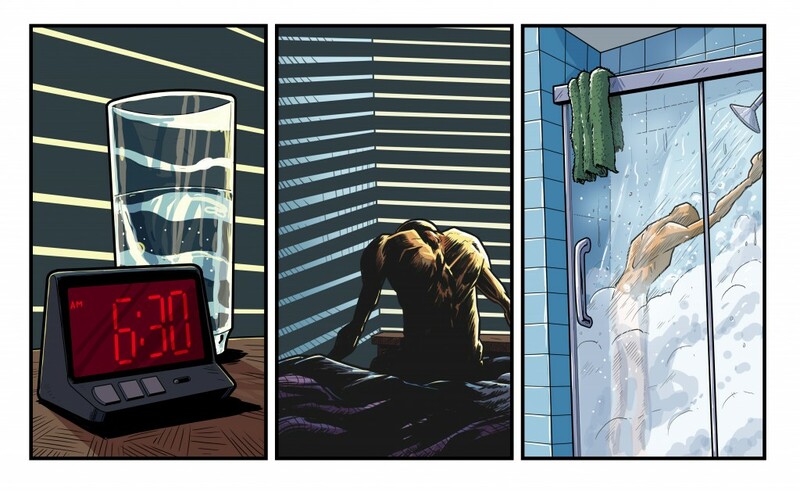 For now, please enjoy this peek at the first three panels of SF 732. I promise you it’s all going to be worth the wait. We’re incredibly excited about this next chapter. More details on what you can expect from it coming soon!